Title: Going away shot of 135! 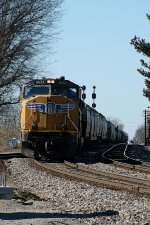 Title: A quartet of Union Pacific engines, ES44AC 7644, SD70ACe 8596, and SD70Ms 4454 and 4633, haul East through Franklin County. Title: Here'a a closeup Union Pacific ES44AC 7644, SD70ACe 8596, and SD70Ms 4454 and 4633. Title: Here's a parting shot of Union Pacific ES44AC 7644, SD70ACe 8596, and SD70Ms 4454 and 4633. Description: This pair of SD70Ms sits in the soon to be opened Global 4 Yard. Description: The northbound Amtrak Texas Eagle(Train 22) passes a Union Pacific work train in the old MoPac Ivory Yard, adjacent to the new River City Casino on a very muggy last day of July. Description: A Union Pacific work train idles in the old Missouri Pacific Ivory Yard while awaiting a new crew in the beautiful soft early morning light of a very hot and muggy final day of July, 2010. Description: UP 4633 and a maintenance truck on the AC. Description: Union Pacific SD70M 4633 is a DPU on the I2G East. Description: A trio of Union Pacific SD70Ms lead 203 west under threatening skies. Description: A yard job passes 209 as it swings to make a cut.